What are the options at getting rid of a stump? 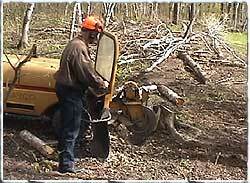 Several times customers paid me to get rid of a stump that they tried to dispose of chemically. They had drilled holes, poured in the chemicals and nothing happened. A year later it still ground out with resistance the same as any other year old stump. Can a backhoe dig out a stump, load it in a dump truck, pay disposal cost and do it all for under $50? What about the price on the dirt required to fill in the hole? I am not going to promote a certain brand. I have used several different sizes and brands. I have used Rayco, Vermeer, Carlton, and a couple brands less popular. 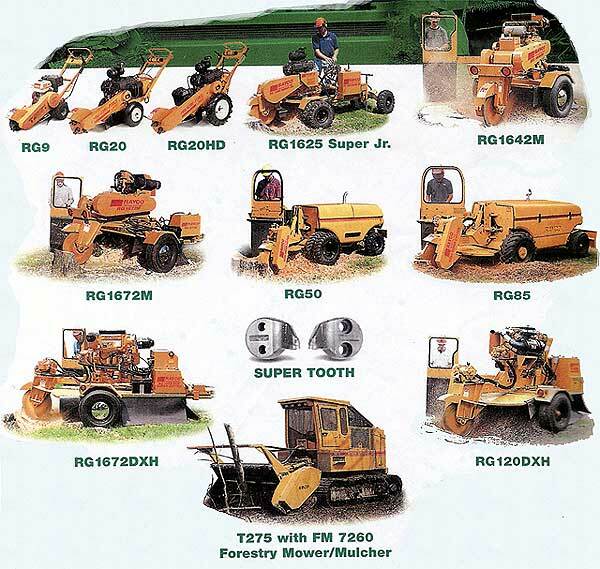 However, here is a clipping of the brand of the stump grinder that I have access to rent until I can purchase my own, again. *The smallest one costs somewhere between $5 to $10,000. Rental places charge about $100 for a day use. Notice: you better be in good physical shape. 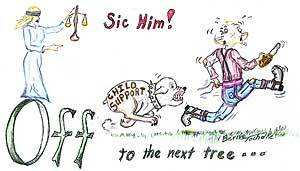 You will get a workout and for one stump quite a long time! * I have used the Super Jr. the next size up. There is a major difference in improvements over the small manual types. These cost between $11 to $15,000 and rent somewhere near $200 a day. * There are four machines pictured that show only one tire. These four machines get pulled or pushed to every stump with a vehicle. Note: If you can’t drive your vehicle to the stump, because the stump is inside of a fenced in area, you can’t grind that stump. * Note: Usually when you rent, the teeth are your responsibility and you get charged extra if you damage any of them. The ones pictured are about $12.00 per tooth. I try to work cheap, but I also need to make a fair amount to be able to operate this very high maintenance machine and pay the rental on it. The hydraulic pump unit an it cost me $7,500 in parts and labor. Operating a stump grinder is not cheap. 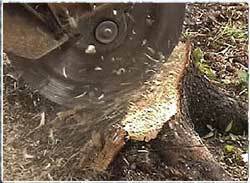 © 2005 SKS Stump Grinding. All rights reserved.